Are you the daring type that seeks out paranormal activity. It may be closer to you then you realize. I would rather just watch the movie. But, for those who like to seek out Haunted Places this time of year here are a few for you. Cavalier Hotel, Virginia Beach- A ritzy hotel built in 1927 and often frequented by celebrities from Al Capone to Woodrow Wilson. A previous owner of the hotel shot himself. The sightings are mainly of a cat and a black man wearing a hotel uniform standing at the 6th floor saying “You do not want to go up there, there is ghost up there”. Front desk employees get reports of seeing the cat or the employee daily. Chesapeake, VA- Elbow Rd- Its reported that if you go to the area that curves by the lake at the Virginia Beach city line, sit on the hood of your car at midnight you will see wet footprints of a little girl approach your car. This is the ghost of a little girl that drowned while her father was fishing. Chicks Beach, Virginia Beach, VA- Fire station- firefighters report seeing the ghost of an ex-firefighter in the station. As well as sirens sounding by themselves, doors slamming, and alarms sounding for nor reason. Dam Neck base Virginia Beach, VA- there are barracks called the “finger barracks”. In Dec 1999, 5am in the morning there was a sighting of a slender transparant and naked slender woman who walked straight out from a wall thru a shower and down the hallway. She was spotted by sailors taking showers. Fort Story, Virginia Beach- is the base for some Army and Navy personnel. Located near Shore Drive is Coast Artillery Rd. Apparently, a ghost of a soilder who committed suicide is often seen roaming the wetlands area. Fort Monroe, Hampton, VA Now Veterans Hospital- In 2005 a veterans hospital opened in Hampton. 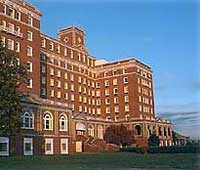 Before it was a veterans hospital it was a hotel called the Chamberlain for Ft Monroe military base. The top floor of the hotel was deemed haunted by several apparitions and was close for that reason. No confirmed reports from patients of the veterans hospital on recent paranormal activity. Gloucester, VA – Roswell Plantation- This historic mansion was once known to be the”largest and finest” of all plantation homes. The home was originally built in the 1600’s and has been lived in by many families. It burned down in 1916 and was deemed a landmark. So what is strange several walls are still standing today. Visitors and grounds keepers report many strange occurrences by the ruins or by the original families grave yard still located on the property. Strange noises, sounds of slaves, drops in temp of more than 15 degrees are reported. Often ghost hunters camp out to see the ghost of a young woman walk down the steps EVERY night. Ok but look at the photo do you see any steps…. Norfolk City Jail, this will give you a reason to walk the strait and narrow. Many night workers in the jail report sitings of a dead inmate roaming the halls on various floors…. Norfolk, VA-, Gresham Dorm, ODU- In 2003 a woman and her husband was gunned down in front of the dorm. The killers were never found. The woman is often seen roaming around bleeding trying to find her husband. No sightings of the husband but the sightings are always reported in November which was the month they were killed. Poquoson, VA – Poquoson Ave is said to be haunted at the intersection near CHurch St. Located near a morgue ghost are sights roaming the road. Many have reported to police a woman in a nightgown asking them to use their phone to call her husband and then she vanishes. Portsmouth, Va- Olde Town- There is no doubt of Olde Town’s haunts people sell out an annual ghost walk to hear the tails. Most famous the Lady in White on Court St. The womans husband had an accident involving the water, the sightings state the woman takes off running down court st and jumps in to the water. This is reported to police every time there is a full moon. Her image has been so real there are reports of grown men trying to jump in the water to save her. Princess Anne Country Club Virginia Beach, VA- Several spirits haunt the 100 year old clubhouse including a ghost in a case that sends guess running thru the hotel in fear and a disappearing bride that is usually sighted in the bar area. maybe the sighter is just drunk………. But employees complain of old time music being played in rooms and the sound of dinnerwear being clanged and tabless being set for dinner. Rumors stait the hotel also has an underground bunker. Surry, Va – Bacon;s castle- Many regularly report sighting a fireball rising up from a nearby cemetary circling the castle, entering a chimney, and disappearing into the basement. USS Caron Norfolk, VA was decommissioned and sank. Was it because it was an older ship we have lots of older ships. Or was it because they were reports of a Gunner’s Mate Chief, that was killed in an injury on the ship, was seen plain as day in his khaki uniform inside the gun mount he was crushed in. Sailors who had duty would complain and report the sitings often and the ship was later sunk. Coincidence? 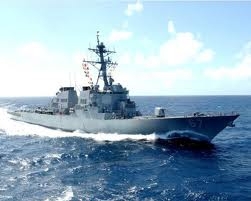 USS Cole Norfolk, VA Many sailors recently report hearing their name being called when they are alone in the hall of heroes or the mess decks. Also sailors report their tools move by themselves in the engineering space. USS George Washington Norfolk, VA Is said to be haunted by the unusual a man, a dog and a little girl. Sailors report sightings and an overwhelming feeling of being watched. President’s House Wren Building- Haunted by a french soildier of the revolutionary war who died there. OKay now I am freaked out- to all you ghost hunters good luck ………………………………..